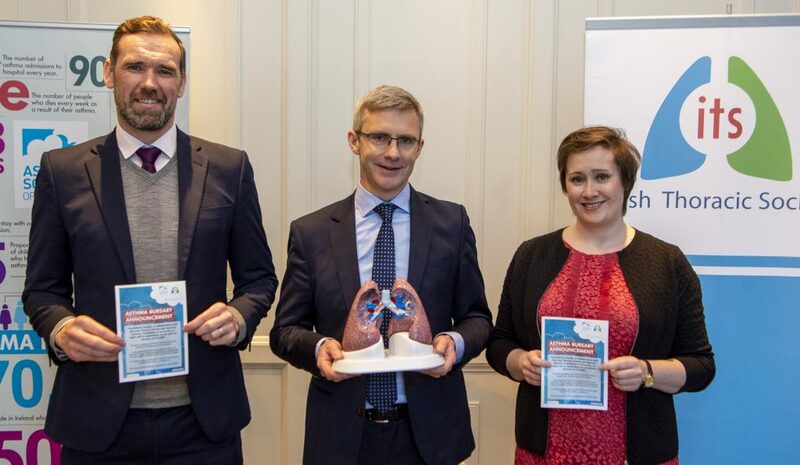 From left to right: Mr Shane Sullivan (Medical Advisor – Novartis), Dr Ross Morgan (President – Irish Thoracic Society) and Ms Sarah O’Connor (CEO – Asthma Society of Ireland) at the announcement of the ASI ITS Asthma Research Bursary at the ITS ASM 2018 in Belfast. At the ITS Scientific Meeting in Belfast, the Asthma Society opened a call for applications for the Asthma Research Bursary. The bursary, which is a joint collaboration between the Asthma Society of Ireland, the Irish Thoracic Society and Novartis Ireland, aims to improve the lives of people with asthma and their families. The bursary will see the successful applicant(s) granted €10,000 to fund an asthma research project. The bursary is open to all medical and allied healthcare professionals based in the Republic of Ireland who are also members of the Irish Thoracic Society. The research project which will have a defined benefit for people with asthma and/or their families. Applications close on Sunday, 6th January 2019 and the successful candidate will be announced in February 2019. Proposals must comprise a research project which will have a defined benefit for people with asthma and/or their families. Be a registered medical or allied health professional and a member of the Irish Thoracic Society. Be employed in the Irish health services, whether public or private, or alternatively be an academic in an Irish research institution. Have support/approval from the employer/department head in which the research is being carried out. Conform to the ethical requirements of best research practice. The successful candidate will be announced at the ITS Scientific Meeting in November 2018. The successful applicant will be required to present their work at the ITS Annual Scientific Meeting 2019 through submission of an abstract. Selection will be made on the basis of scientific and expert evaluation of the application and the proposed work as set out in the project description. The scoring criteria are as follows: clarity of hypothesis, innovation, feasibility, candidate eligibility and research track record, wider asthma research and implications for patient quality of life. Independent reviewers will be selected by a Joint Committee of the Asthma Society of Ireland and the Irish Thoracic Society to carry out this task and the final decision will be made by this Committee with the assistance of the reviewers’ assessments. Reviewers’ assessments are strictly confidential and cannot be divulged outside the ASI/ITS, or to the candidates themselves. Early career researchers are encouraged to apply. The successful applicant will be required to submit reports at regular intervals throughout the duration of the research and an end-of-project report within a month of the end of the project. This report will be published on the ASI and ITS Websites. Reference to recent work/publications in the field. ii) One page summary of how you propose to use the funding. iii) Letter of support from intended supervisor of project (if applicable).